A leading car manufacturer is to give drivers the chance to try out hydrogen-powered vehicles. As part of "Project Driveway", General Motors (GM) will put more than 100 fuel-cell vehicles in the hands of customers before the end of the year. 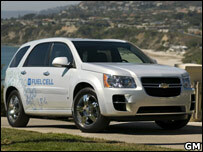 The cars will be based on the Chevrolet Equinox SUV. GM says they will initially go to celebrities, policymakers, the military and other "influentials", but the public can also sign up online. "We're going to get feedback from customers to help us understand this market, and that's going to help set us up, hopefully early in the next decade, to really go to market for real with fuel-cell electric vehicles," said Larry Burns, vice president of research and development and strategic planning for GM. The vehicles will be tested in the US, Germany, South Korea, China and Japan. Those countries have been chosen because they have refuelling facilities in place. People selected to take part in the trial will have to live within a reasonable distance of a hydrogen station. The hydrogen is fed into a fuel cell onboard the vehicle to produce electricity, which powers an electric motor connected to the front wheels. The exhaust is water vapour, which is vented through slots in the rear bumper rather than a conventional exhaust pipe. Industry experts told the BBC's Discovery programme that hydrogen would be just one of the propulsion, or "drivetrain", technologies used to make cars greener in the future. "The car of the future will have a modular approach to [its] drivetrain," said Derek Charters from the British motor industry consultants Mira. "The car will be able to be fitted with a number of power units. At the stage of buying the car, you will define your requirements by your lifestyle. "You'll go into a dealership and tell them what you want to do, and they will then recommend what type of drivetrain to put in." That might mean that if you do mostly city driving you would have a large electric motor and a big battery pack fitted. But if you do some urban work and some long-distance driving, you might opt for a hybrid, with a smaller electric motor coupled to a petrol engine. Today's hybrid cars either generate electricity using the petrol engine or during braking by using the motor as a generator. In the future we are likely to see cars with much higher capacity batteries, so they can be plugged in at home overnight. "I think you're going see two or three companies introducing the plug-in hybrid by 2010," said Joseph Romm of the Center for American Progress and previously responsible for clean transportation programmes at the US Department of Energy. "You take a hybrid, and you put on it a battery capable of taking an electric charge from the grid, and running for maybe 20 to 40 miles in all-electric mode before reverting to be a gasoline-powered vehicle - because most people don't travel more than 20 or 25 miles a day, and even less so in Europe than the United States. "The opportunity is you could run most of the time on electricity, and only use gasoline on longer trips," he said. "These cars, like all early model cars, will probably be on the expensive side, but I think there will be a great interest in them." You can hear more about the car of the future in the Discovery programme broadcast on the BBC World Service on Wednesday 3 October. Details on the different ways of listening can be found on the programme's website.